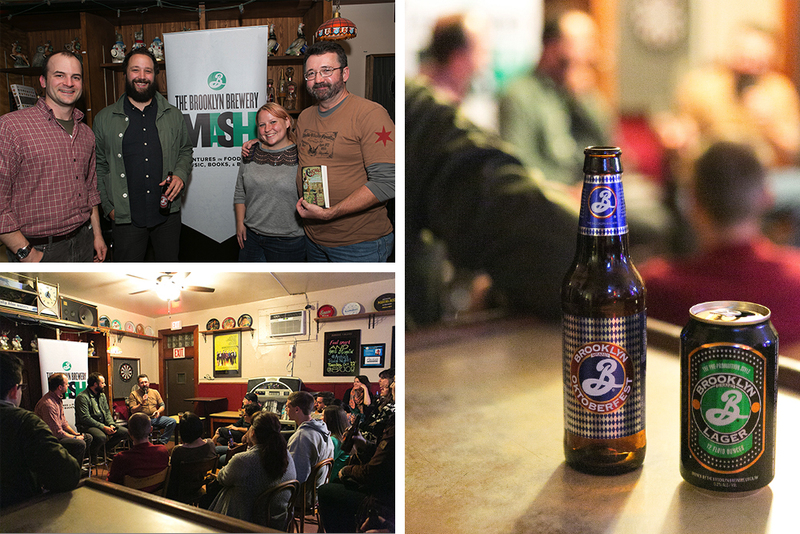 Brooklyn Brewery hit the road this year with an ambitious collection of events aiming to bring attention to the many facets of America's craft brew scene, as well as benefit Slow Food USA and its chapters across the country. The Mash Tour, as it's known, took place in 11 cities, including Chicago, looking for "adventures in food, film, music, books & beer." As part of a week-long presence in Chicago, the closing event was dedicated to Chicago's brewing past, present, and future with myself and Bill Savage, one of our best local historians and author of Chicago by Day and Night, "a resurrected 1892 guide to Chicago’s entertainment nooks and crannies offered to tourists and travelers who flocked to Chicago by the hundreds of thousands for the World’s Columbian Exhibition." Savage and I set out to have a casual conversation, and a bit of debate, about how Chicago's beer scene has changed, or not, over the past 100+ years. As an historian, Savage spoke with an amazing amount of knowledge and insight regarding the legal, industrial, and cultural characteristics that defined so much of this country's beer culture for decades. My job was to expand on some of that with a story about how today's craft beer culture both continues, and defies, much of what's come before us. Joining us at Archie's Tavern in West Town, was Chris Quinn of the Beer Temple, arguably Chicago's finest craft beer retailer, as a moderator of sorts, but also a contributor in his own right. His perspective on craft beer in Chicago is shaped by his experiences as a bottle shop owner, and his insight helped connect some important dots between Chicago's past as present as well. I was impressed that this event happened in the first place. Brooklyn Brewing certainly didn't take the easy way out. I'm sure they could have tapped a barrel aged beer, given away some SWAG and called it a day. Instead, they spent the time to search out and ally with progressive groups life Slow Food to put together something of actual substance. If anything, perhaps us Chicagoans should feel a little ashamed that a New York brewery walked in and set up one of the coolest discussions about our beer scene in recent memory! Regardless, my cool designer ball cap goes off to Brooklyn for really caring enough about MASH to let this happen. I loved the interplay between past and present. How things that had happened long ago - foreign buyouts of local brands being one example - were happening again. I wanted to dive into why these things were happening. I wanted to see if there was any connection, or if it was just coincidence. I also wanted to try and predict what our current and past beer scenes could tell us about the future. Where were we headed? At times I caught myself grinning just listening to Michael and Bill talk and thinking "I can't wait to see where this thing is headed, but either way, it's going to be fun." I meant that both in terms of the actual discussion, and the Chicago beer scene as a whole. As the moderator, Quinn's notes on the topics (below) serve as a helpful summary of the discussion. While by no means comprehensive, this should give you a good idea of how big the question of beer has gotten in Chicago. One thing we all agreed on, is that the future of Chicago's beer industry, craft or otherwise, will get very interesting indeed. The enormous amount of control that used to lie with the brewer, who controlled all three tiers of distribution (production, wholesale, and retail), was outlawed following prohibition. While this has kept the breweries from directly controlling things, the vacuum seems to now have been filled by the huge interstate wholesalers, who exert massive amounts of control and collect huge sums of money. For much of America's history, the corner pub was seen as a place where men, and only men, could seek refuge from their personal and professional responsibilities. While this is still the case, woman are feeling more and more comfortable in bars today, with their desire to drink craft beer and other high-end beverages playing a large role in the economics and culture of craft beer. What made the big breweries successful in the first place was their ability to perfectly replicate a light, refreshing lager - something that still proves very difficult for many of today's craft breweries. While the highest quality beers ever brewed are currently available to people, it hasn't been able to shake the connection it has with mindless overconsumption, be it the hiccuping hobo of the 30's or the funneling frat boys of today. This needs to change, and craft culture and beer-focused restaurants are helping tremendously. Where a person eager to taste a truly world class wine may have to spend well over $100 per bottle, the same can be done with beer for about $5. The all but non-existent barrier to entry that beer enjoys is a huge reason for it's ongoing popularity over other alcoholic beverages. Where beer may have beer seen as pizza in the past (even if it's not very good, it's still beer and that's good enough), that is far from the case now. With literally thousands of different beers being brewed each year in the U.S., a group of dedicated, at times obsessive, hobbyists have formed around the pursuit of the rarest and most highly rated beers. Where the highest pursuit a brewery could hope to achieve in the past was nailing down a recipe or two with perfect consistency, brewers today revel in experimentation and pushing the boundaries. While great beer is now relatively cheap and accessible, we are also seeing beers aimed at fringe consumers who are willing to go to great lengths, and pay ever increasing prices in order to obtain them. Lower abv, a counter trend? Where highly alcoholic beers were the craft beer gold standard for almost twenty years, we are now seeing consumers begin seeking beers they can enjoy two, three, or four of at a time without having to worry about falling off their bar stools. Just as the big brewers of pre-prohibition America needed to expand wider and wider in order to maintain growth, we are seeing the larger players in the craft scene doing the exact same thing through massive expansions and the opening of satellite breweries. Likewise, the same problems smaller regional breweries had competing with the prices and marketing might of their larger competitors 100 years ago, today's craft brewers are feeling the pressure from other craft houses. Craft beer has relied on an audience that buys into the idea that beers made in small batches and drunk close to the source taste better. This image is becoming harder for breweries to align with when some of these same breweries are now in 35 states and producing over 100K barrels annually. Like Jazz, Americans have taken influences from around the world, transformed them into something new, and are now sending them back across the water. We sent a shipping container full of craft beer to the Berlin beer festival from California this past year, and now Brooklyn Brewery itself is partnering with Carlsberg in Stockholm to create New Carnegie Brewing, making American craft beer in Europe a permanent cultural institution. A huge thanks to Brooklyn Brewery for putting together such an amazing number of thoughtful, focused events that help push our thinking forward in craft beer. Thanks for Slow Food's Chicago chapter for partnering and hosting the event. Thanks to Archies for serving some great beers that night, and bringing in a great crowd of culture vultures. And thanks of course to Chris Quinn of the beer Temple, and Bill Savage for their insight and constructive debate that night.